The assisted living programs at Grand Villa of DeLand are designed to enhance a resident's life. Our Activities Coordinator plans activities such as exercise classes, live musical performances, and excursions to local malls and restaurants. The activities are designed to support the physical, social, and spiritual well-being of our residents. Everyone is invited to participate according to his or her own preference. Health and wellness services are available on-site at Grand Villa of DeLand. General practitioners, podiatrists, dentists and optometrists visit regularly. We also offer on-site physical, speech, and occupational therapy for residents who want to avoid the stress of traveling. Residents can make an appointment with a visiting physician, or schedule a complimentary ride to a local doctor's office. Our devoted staff provides personal assistance as requested, including medication management and coordinating other support services and supplies. 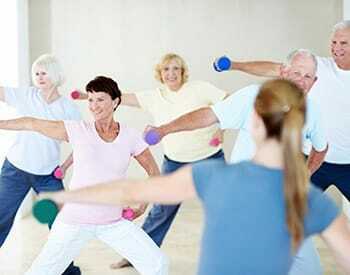 At Grand Villa of De Land we are committed to helping our residents stay fit, healthy, and happy. Please contact us to learn more about our community and lifestyle options.